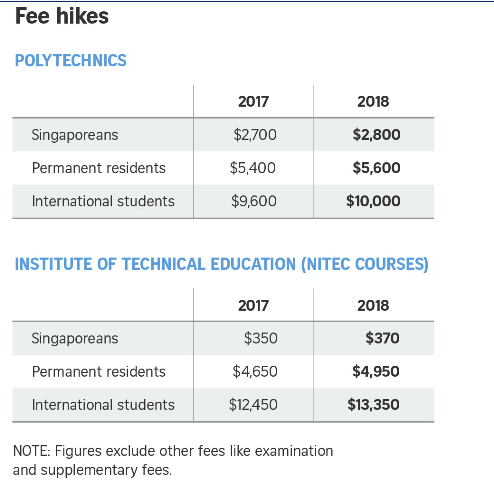 Tuition fees for students entering the polytechnics and Institute of Technical Education (ITE) next year (2018) will go up by between 3 per cent and 7 per cent. The revised fees, which were posted on the schools’ websites on Monday (Dec 11), apply only to newcomers in the 2018 academic year. The polytechnics’ term starts in April, while ITE has two intakes in January and April. This entry was posted on December 12, 2017 at 1:51 pm and is filed under Singapore. You can follow any responses to this entry through the RSS 2.0 feed. You can leave a response, or trackback from your own site.